Today’s business environment demands flexible ways of working and increased customer services. Organizations seek to extend the reach of their converged voice and data network but also save on branch office costs. They wish to integrate wireless communications without compromising on voice quality, availability and security. NEC’s Business Mobility IP DECT realises all of this, and much more. 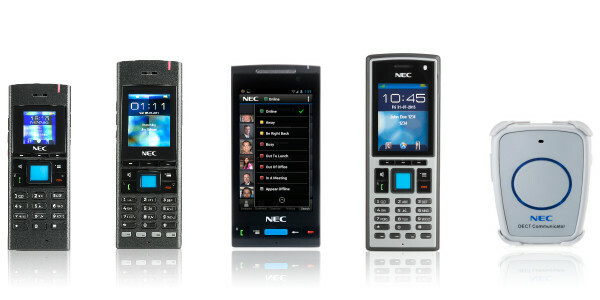 All our DECT handsets offer excellent voice communication: crystal clear speech, loudspeaker and hands free support, seamless handover and roaming, high security with DECT authentication, and seamless integration with NEC communication servers. Applications include central directory, presence, text and alarm messaging and location detection. The telephones give your employees flexible, easy and secure communications as they roam about your company’s premises, while providing most of the features and functionality of a desktop phone, with mobile enhancements such as text messaging, alarming, programmable keys, and integration with third party applications. Unsure how best to achieve the most efficient and cost-effective workforce?